Try a social sport: Don’t feel like you have to be a pro athlete to play social sports. The keyword here is “social”. Try searching for sports leagues in your city that cater to adults and offer social leagues. These leagues include low-competition sports like kickball or bocce and a visit to a partner bar afterwards. You can join a league as a free agent, get combined into an existing team, and get to know other young professionals in your city! Network for business and friends: We’ve already talked about how to master the art of networking for professional development. But what about mastering the art of networking for friends? The more you go to professional events that interest you, the more likely you are to meet other like-minded young professionals. Check local event calendars of interesting companies or young professional networking groups and challenge yourself to go to an event alone. You never know when you might make your next connection or your next friend. Go online: We don’t mean Google “how to make friends”. Check out Meetup, a platform that allows you to find groups of people nearby with similar interests. You can search by category such as fitness, social activities, and hobbies and crafts. You’ll then see Meetup groups close to you and the dates and times of suggested events. This allows you to easily translate your interests into offline events with other interesting people! It’s the perfect recipe for friendship. Now for a bonus tip just for the female young professionals. Consider using the dating app Bumble on “Bumble BFF” mode. This allows you to match with other women who are looking for friends and are interested in the same things you are. Find your alumni group: Missing friendships based on college? Check your alumni center to see if there are any local chapters near you. They often host networking events or viewing parties of your college’s sports teams. If you’re not feeling your alumni group, try seeing if any national clubs you were apart of have alumni networks. This includes national honor societies, big volunteering organizations, and Greek life! You can extend your love of extracurricular activities into your post-grad life and make some new friends along the way. We know that half the battle is convincing yourself to try something new. Just remember there are thousands of graduates every year in your same shoes. So get out there and meet some new people! 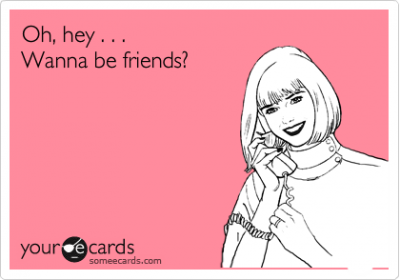 Your post-grad friendships await you.